Celebrate life with a Custom Fondant Cake! Are you having a hard time finding the perfect gift for someone who seems to have everything? Get them a custom fondant cake! Perfect for Mother’s Day, Father’s Day, Wedding Proposals, Saying Thank You, Job Promotion, or Celebrating a Divorce being Finalized! Get your inspiration from our website or send us a picture of something you are interested in having us reproduce, Pinterest also has great ideas! Tell us your theme and we will custom design the perfect one-of-a-kind cake to be the highlight of the event. Schedule a consultation today! Custom fondant cakes are priced by the amount of servings and the amount of detail. Call today for a free consultation before your next special occasion. 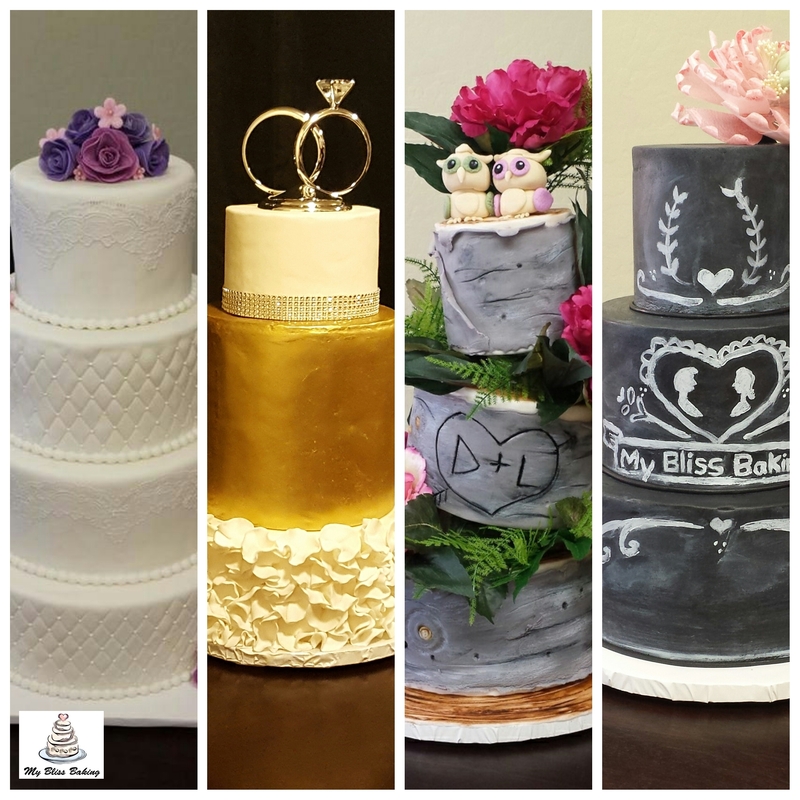 Custom fondant cakes for Weddings, Bridal Showers, Birthdays, Anniversaries, or any occasion. When you want muffins for your next early morning office meeting, something better than your grocery store cookies, or you don’t have enough time in the day to make brownies for movie night, you have come to the right place. Let My Bliss Baking take care of the task for you. Our love of baking shows in our creations. Deliciously tasting baked goods are prepared with love, witch gives them the enjoyable flavors you will adore. Cupcakes, Brownies, Chocolate Chip Cookies, Cowboy Cookies, Monster Cookies, Pumpkin Chocolate Chip Muffins, Rice Crispy Treats, and more! Take a look at the Baked Goodies page for some pictures of the items I offer to be purchased. I love to bake sweet treats! Baking has been my passion and is very therapeutic to me. I have enjoyed coming home after a long day and bake something that I enjoy making. Turn on my favorite tunes and start mixing up something delicious. The yummy smells that come from the oven make me smile. The other part of baking that I enjoy is sharing what I’ve made. If you have ever worked with me before, you know I would often bring baked goodies to work to share. This sharing often gets my co-workers addicted to my home baked goodies as well. I have had co-workers tell me that my baking is like crack, you can’t just eat one, very addicting. I would say my baking style, 9 out of 10 times, includes chocolate. I don’t care for nuts, fruit, or other things in my home baked goodies. My favorite chocolate is Hershey’s Bliss Dark Chocolate. I have to admit I probably have some everyday. This is how I came up with the name for my company. I have enjoyed making fondant decorated cakes. I enjoy the planning design, calculating the necessary supplies, and building a custom fondant cake. It is very exciting to see the finished product. See the Custom Cakes page for pictures of the creations I have enjoyed making.